Fall is a beautiful time of year. The leaves, the crisp air, the smells, pumpkin soup! As exciting as it can be it is still a season of change. And after the holidays, that change can really set in for those of us living in areas where trees are bare, there's little snow, and everything is sleeping in wait for spring. So it went in October 2010. It started like any season. The trees on fire and the air crisp and clean. The fireplaces glowing and the marshmallows roasting. Pulling out jackets for cool winds and wool socks for chilly toes. Changing closets from summer to fall/winter. You see, I have three amazing daughters. All of them struggle in many ways, but my second daughter, Melissa LeeAnn, struggled harder then all of us. She was my high school drop-out, my 19-year old single mom, and my college graduate! But even with all her accomplishments to make her proud, at the age of 29 she could take the struggles of her illness no more. That's right .... the dreaded "s" word .... suicide. In the wake of destruction she left behind her daughters (6 & 10), her husband of 8 years, her sisters, me and her dad, her grandparents, and countless aunts, uncles, cousins, and friends. While the last leaves of fall fell from the trees the cold bleakness of a mid-west January had already arrived. A bleakness that only those who have endured this kind of change can understand. Oh, all my friends try to understand and they try to comfort. But it is a pain and a loss we all must bare and come to terms with each in our own way. So the birth this year of "Star of Rissa." I have designed quilled snowflakes for all of my daughters and granddaughters over the past couple years. While creating patterns I realized I had not created one for my Melissa - lovingly nick-named by my younger daughter who started out not being able to pronounce Melissa but instead called her Rissa for a time. She moved on to calling her sister Melissa, but Rissa is what I would call her during special mom/daughter talks. Yesterday marked the 5th year. For me, the bleak mid-January cold season does not stay around very long now. A smile, a laugh, a really awesome pair of shoes (Of which she left over 300 pair behind and some the same style but multiple colors!) will bring a smile to my face and a warmth to my hurting heart. While she was here, my Rissa lived life big and loud. A big star taking up space in the heavens seems much more appropriate than a soft, melting snowflake. 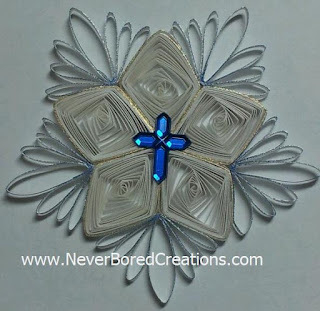 Upon my return from Silver Dollar City I will complete this design's pattern and share it with my quilling buddies so you can make one for someone big and loud in your family. Until next time . . . rollin' rollin' rollin'! Keep those papers rollin'!! Your Rissa creation is just gorgeous. I'm so sorry to hear about your daughter. My daughter is Melissa, as well, and I can't imagine losing her. My husband and I have both had suicides in our families, and truly believe they are the most difficult to understand. Thoughts and prayers are with you, Lisa! We drove past Silver Dollar City on Saturday, but were on our way home from the Great Passion Play in Eureka Springs, and had evening plans. No time to stop :( Maybe next year! Hope you did well!!! Thank you, Patti. We spent 20 years helping Melissa with her illness. I think that is key in understanding suicide of this type. I understand the illness that gripped her life. That doesn't take away the pain of her loss, but it does leave me with a piece that passes all understanding. Yes, Silver Dollar City was very good. I'm looking forward to next fall!